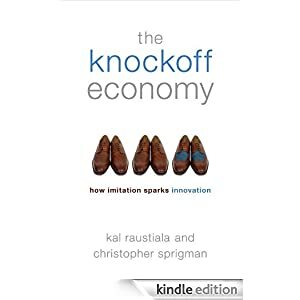 Fascinating interview with law professor Chris Sprigman on the excellent Surprisingly Free podcast, about his forthcoming book, The Knockoff Economy: How Imitation Sparks Innovation. Sprigman’s book sounds great, although he does seem (from indications in the interview) to accept (a) the utilitarian model for evaluating law, and (b) the idea that IP law makes sense in some fields, such as pharmaceuticals. For a criticism of the utilitarian approach, see the section “Utilitarian Defenses of IP” in my Against Intellectual Property; for the latter, see chapter 9 of Boldrin and Levine’s Against Intellectual Monopoly. Sprigman does a goob job of showing how a variety of industries work absent strong IP law, and in arguing, from a mainstream utilitarian perspective at least, that we should be very reluctant to extend IP to areas not currently covered, or even to strengthen it. Even in the music industry, where lack of copyright seems to be hurting the music industry, it is not affecting the production of music itself, and since one of the purposes of copyright is allegedly to stimulate the production of creative works but not to support a given industry, then it does not need to be strengthened; if the movie and music industries themselves shift around, while we still get a huge outpouring of movies and music, copyright does not need to be strengthened. Christopher Sprigman, professor of law at the University of Virginia discusses his forthcoming book, The Knockoff Economy: How Imitation sparks Innovation, co-authored with Kal Raustiala. The book is an accessible look at how industries that are not generally protected by intellectual property law, such as the fashion and culinary industries, are nevertheless thriving and innovative. Sprigman explains why this happens and what the phenomenon can teach us about other industries, such as the music and movie industries. Artist Resale Royalties: Do They Help or Hurt?